Suspended platform or swing stage on a building or structure is at risk to the weather events! Wind can channel or funnel in between buildings or structures and subsequently increase in speed, compared to wind events forecasted and logged in open space, and at ground level. Further, wind events and wind gust events can differ depending on the specific location of the suspended platform or swing stage relative to the orientation of the building or structure, and on the height of the suspended platform or swing stage above ground level. SSFI “Wind Speeds and Swing Stages” recommends that the competent person on site is “…best able to assess site conditions and determine site-specific conditions for halting work from swing stages due to high winds.” It is important that the competent person understands the schedule activities, equipment operations, maintenance tasks, and work results relative to suspended platforms and swing stages. 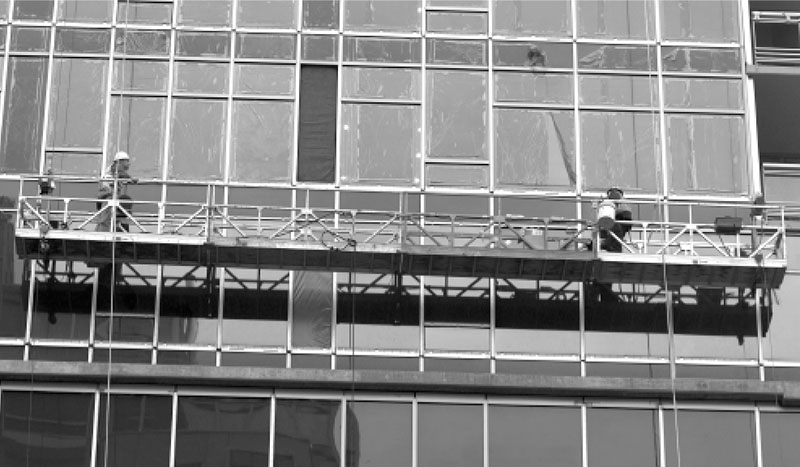 Further, the Scaffolding, Shoring & Forming Institute (SSFI, www.ssfi.org) recommends stopping work, securing materials, and suspending operations, if forecast wind events and wind gust events are greater than 25 mph (40 km/h) for two-point systems and 20 mph (32 km/h) for single point systems — if a hazard assessment specific to the construction project or to the operations and maintenance (O&M) site is not available each work day. When managing and mitigating weather impacts and safety risks to suspended platforms, swing stages and other equipment, contractors must assess numerous factors, such as material type and work location, which can lead to a “sail effect.” It is the responsibility of the competent person and equipment operator to understand the forecast wind events and wind gust events during the work day and shift and the respective site-specific safety risks. Federal Occupational Safety and Health Administration (OSHA, www.osha.gov) standards do not require contractors to stop work on suspended platforms and swing stages at or above specific wind speed thresholds. However, state and local regulations vary! The Scaffolding, Shoring & Forming Institute recommends to check with your local authority about maximum allowable wind speeds on suspended platforms and swing stages. The Scaffolding, Shoring & Forming Institute (SSFI, www.ssfi.org) is a trade association of leading manufacturers of scaffolding, suspended scaffolding, shoring, forming, planks, platforms and related components. The institute focuses on the technical aspects and safe use of scope products. SSFI members have demonstrated a commitment to improving the industry. Look to these members to meet your equipment needs. And look to the SSFI for continued leadership on standards, technical resources and safety information.